When photographer and educator Andrew Darlow appeared on The Photo Show with Mike Pach to discuss his book 301 Inkjet Tips and Techniques, he made an interesting point about printing at home (around the 16:30 mark). Don't. WhiteWall ultraHD Print. Ready to hang right out of the box. Unless, he said, you're willing to commit to printing 10 or so 11x14-inch prints every month so you go through a set of inks in at least a year and a half to prevent the print heads from clogging. But there are, he said, plenty of labs that can make a gorgeous high-end print of your image using the best materials and saving you the trouble and expense of doing a less impressive job. That's pretty sound advice. The only question is where do you send your image file for printing? Germany, according to the Technical Image Press Association. When TIPA selected German photo lab WhiteWall as the Best Photo Lab Worldwide for 2017 we arranged to have an image printed there to see for ourselves what all the fuss was about. WhiteWall has been around for 75 years printing from their plant in Frechen, Germany, just outside Cologne. WhiteWall and Lumas, which prints photographs for many museums and galleries worldwide, are both brands of Avenso GmbH. While all the printing is done in Germany, the company boasts a turnaround time of "within 10 days" and it consistently beat that in our experience. It offers a wide array of printed products but its premier product is the ultraHD print. We ordered a 6x8 ultraHD print and for comparison, we also ordered a less expensive 6x8 conventional print which we'll refer to as the Lambda print. The prints can be mounted behind acrylic glass or shipped unmounted. We ordered a 9x12 ultraHD print mounted behind acrylic glass, too. 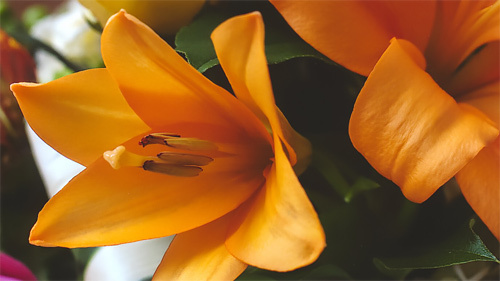 WhiteWall's ultraHD photo prints are unique to the company. They are exposed using a solid state laser onto light-sensitive photo paper that is traditionally processed. Before exposure, though, the paper is stored in climate-controlled conditions to keep it perfectly flat. That's one factor that lets it achieve better resolution and sharper definition than conventional prints, the company says. Those exposure capabilities, WhiteWall explains, make it possible to reproduce very bright and very dark areas more intensely and with more differentiation than previously possible. And it more reliably duplicates results for multiple prints. For best results, the company recommends editing your image using the ultraHD on Fujicolor Crystal Archive DP II, glossy ICC profile available on its site. To appreciate the difference between an ultraHD print and a conventional print, we ordered a Lambda print which can use the same paper as the ultrHD print but the sheet is not climate-controlled. In addition, different laser technology is used to expose the sheet. Matte, glossy, silky or velvet finishes are available. A thin white border can be incorporated on request. For best results, WhiteWall recommends editing your image using the Fujicolor Crystal Archive DP II, matte/glossy ICC profile. WhiteWall's ordering process software checks your files for the right color profile and advises you of the maximum print size your file will support. So you can leave it entirely up to WhiteWall. But it's always wise to understand and comply with a vendor's requirements to optimize your tonal and color edits. 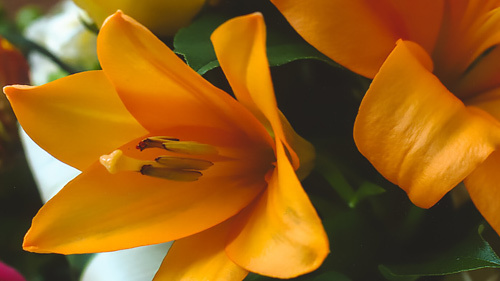 File format can be either 8-bit JPEG or TIFF files with a resolution of 300 dpi and a modest sRGB color profile or a gamma of 2.2 for grayscale files. So our 6x8 files would have to be at least 1800x2400 pixels. WhiteWall accepts files as small as 0.4 megapixels and as large as 625 megapixels but the optimum size depends on your print size. The WhiteWall FAQ helpfully explains what this all means in simpler terms. For example, it reports that your 8-Mp smartphone can make a print as large as 50x40-inches. 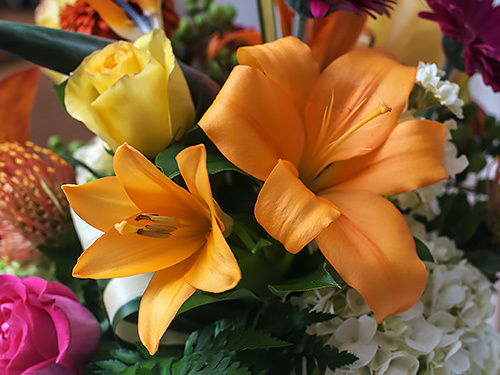 We selected a 2014 image of a bouquet of flowers that had a shallow depth of field with forward elements in sharp focus. We optimized our image by running it through Piccure+, which also converted the DNG file to TIFF. Original Image. Optimized in Piccure+ before applying the WhiteWall ICC profile. We brought that into Photoshop CC and applied the sRGB color profile to the image by using the Convert to Profile... option under the Edit menu. 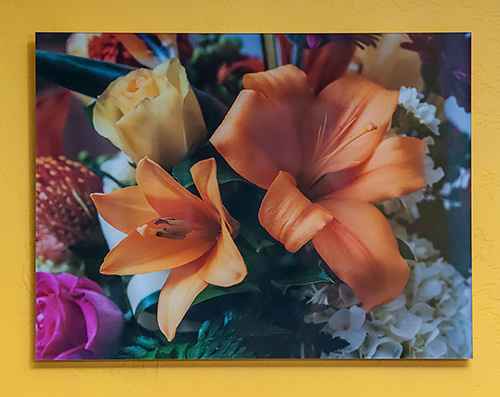 After cropping the image for the 3:4 aspect ratio of a 6x8-inch print, we also evaluated the image using the WhiteWall ICC profile for both the ultraHD and the conventional Lambda print. You can apply the downloaded profiles using the Menu > View > Proof Setup > Custom... menu command. That led us to apply a bit more contrast using Curves. Final image size for both images was 3824x2868 pixels. That was more than sufficient to meet the requirements for both print sizes. With the image prepped, we were ready to place our order. Our first order was for one ultraHD print and one Lamba print, both on glossy paper. To make the comparision fair, we decided to print the Lambda on the same paper as the ultraHD, Fujifilm's Crystal DP II paper with a glossy surface. Crystal DP II is a silver halide color photo paper for making continuous tone color prints. WhiteWall is making traditional color prints, in other words, exposing the paper using light -- in this case, a laser -- and developing it in a traditional photochemical process. The ultraHD print, however, uses climate-controlled storage for the paper to keep it perfectly flat during the exposure by laser. That is one reason the ultraHD process results in a noticeably sharper image than the Lambda print which uses the same paper. WhiteWall said the ultraUH process uses a "solid state laser which is a different laser than the one used for Lambda. Also the process is better synchronized as we use a special machine for the exposure." If there's one thing you can count on us for, it's to screw things up. And we screwed the order up a couple of ways. WhiteWall offers a number of options but it's wise to think of them as entirely different products rather than options you add to a basic order. We weren't thinking that way. So we ordered our 6x8-inch ultraHD print and our 6x8-inch Lambda print, thinking there would be a way to specify mounting under acrylic glass. There wasn't. It's a different product. But that let us compare the two 6x8 prints to a 6x8 print made on DNP's DS620A dye sub printer here for testing. All three are continuous tone prints but the WhiteWall prints are exposed and processed photo paper while the DNP print is dye sub. More on all that later. 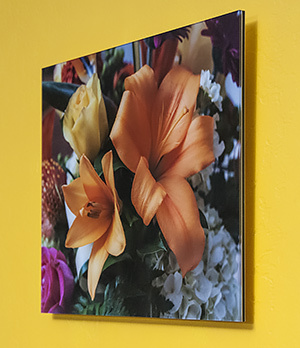 The acrylic glass product bonds to the print, which is sandwiched to an aluminum backing in a technique known as Lumasec that has become the preferred mounting for photographic art in museums and galleries. The acrylic glass itself, we were told, uses a special silicone that prevents it from expanding and contracting in heat and humidity so it never dries out and cracks. Acrylic Glass Mount. 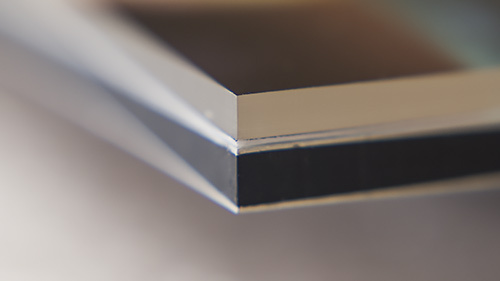 The acrylic layer (top) is permanently bonded to the Fujifilm print (middle) bonded to the aluminum Dibond backing (black with aluminum panels). It does require delicate handling. A microfiber cloth and no harsh abrasives to clean the surface, for example. All of WhiteWall's products include a five-year guarantee. The company also offers a price guarantee in which it will refund twice the difference up to four weeks after you order for comparable products. And your satisfaction with the original order is guaranteed. You don't have to set up an account with WhiteWall to order from them, but we had problems using our voucher code, so we did. Ordering Process. Click for the animated six screen shots, five seconds apart. You likely won't have the problems we had, but we found the error messages on the order form more than a little confusing, although the process itself wasn't. It was a five-step process that included 1) selecting the product, 2) uploading your photo, 3) selecting a size and format, 4) selecting a paper and 5) other options, including selecting a frame, adding a border, etc. WhiteWall also provides some editing functions for your uploaded image, including cropping, orientation, effects and image enhancements. But we recommend you do all that in your own image editing software, not in your browser. Final Order. Our order displayed in the cart. Our order was promptly confirmed by email and we received status updates during production until it was shipped. WhiteWall delivered our two 6x8 prints carefully wrapped, separated and padded in a single corrugated cardboard mailer that arrived from Germany via the U.S. Postal Service. Prints. Corrugated cardboard envelope and USPS delivery. 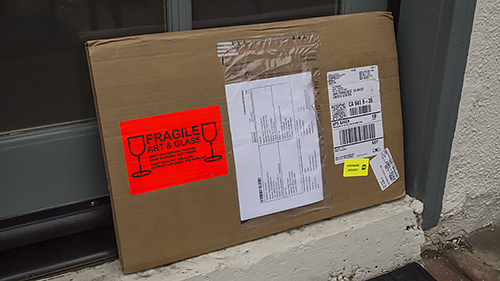 Shortly after, UPS delivered the 9x12 ultraHD print in acrylic glass from Germany using a slightly more padded corrugated mailer for the larger product. Acrylic. More robust packaging and UPS delivery. Our May 19 order was shipped May 23 with an email promising delivery in 7 to 11 days. It arrived on May 30, six days later via the U.S. Postal Service. Our May 31 order shipped June 6 via UPS, again promising delivery in 7 to 11 working days. It arrived June 8. 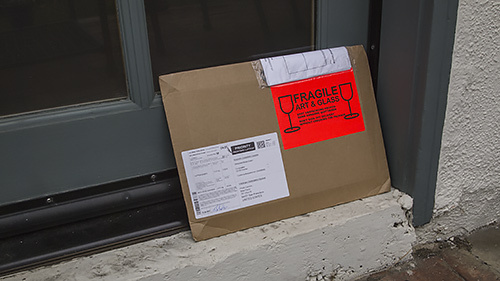 In fact, shipping photo prints seems to take a week even in the continental U.S. That was our experience with Fracture. And when you consider Amazon's deliberately delayed shipping policies for its non-Prime standard or free shipping, a weeks seems pretty fast. That the parcels came from Germany just makes it all the more remarkable. But it was just another indication that WhiteWall knows what it's doing. Packaging protected both types of product more than adequately. The 6x8 prints were each covered with a light glassine sheet with identifying labels on them. They were enclosed in a heavier glassine envelope which was wrapped in a folded glassine sheet. That package was itself wrapped in a piece of white Styrofoam which was inserted into a folded piece of corrugated cardboard. All that was slipped into the cardboard envelope. 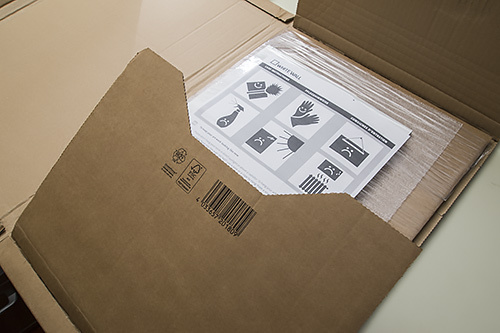 Print Packaging. More than adequate protection. The acrylic-mounted print required a bit more protection. 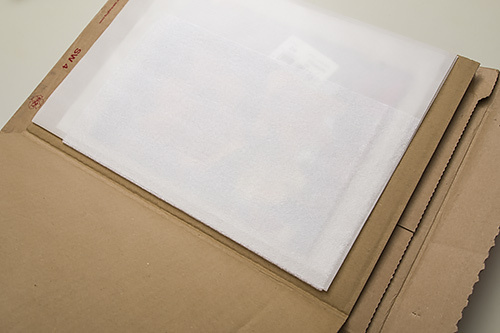 It was wrapped with cling wrap in a corrugated cardboard sled with Styrofoam protection over the glass and an instruction sheet on top to inform you about handling. Acrylic Packaging. A little more protection. Please don't hang your work in direct sunlight or above a radiator. To hang your art work level, simply use two nails or screws fixed into the wall. DO NOT use a wire or a rope to hang from a single point. To dust our image, use a soft, sry, lint-free cloth (a microfiber, for example). To keep your work looking like new, do not, under any circumstances, use glass cleaning products for your photo on aluminum or Forex backings or behind acrylic glass. Be careful not to put pressure on the surface when wiping. The packaging provided protection in transit but also on arrival where too many times we've used a box cutter to get into a package only to find out the merchandise wasn't shielded. It was also no heavier than it had to be, saving shipping costs. Mounting Hardware. Two bars of rails across the back. 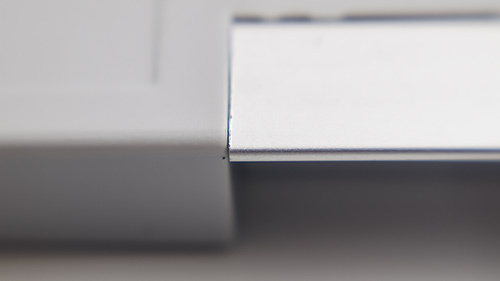 The mounting hardware consists of two bars of metal rails with plastic end caps that are permanently mounted to the back of the piece. While WhiteWall recommends using a pair of nails, screws or hangers to hang the print, it isn't actually required. We balanced the lightweight sandwich on one hanger for our product shot. But that was a temporary staging. Detail. The rail accommodates a pair of nails, hangers or screws protruding from the wall. Two will keep the piece level. It is, in fact, much wiser to use two anchors. It will guarantee that your artwork remains level. Floating. The hung print appears to float off the wall. There are two rails so the piece floats off the wall about 3/8-inch. There are no bumpers to protect the wall, but the endcaps are plastic and don't scratch. You aren't obliged to live with WhiteWall's mounting system, however. The piece can be inserted into a larger matted frame as well. 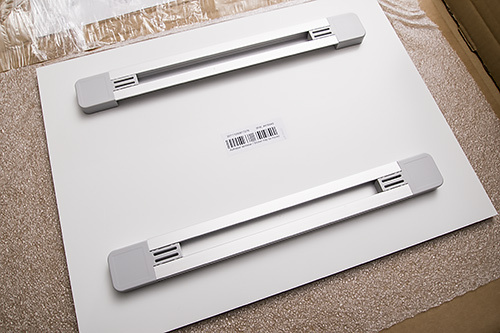 The rail mounting system is used for pictures with an edge as large as 10 inches. Smaller pictures use a hook mounting system. WhiteWall conveniently provides price information alongside its product descriptions as well as a comprehensive price chart with a link to shipping rates, too. 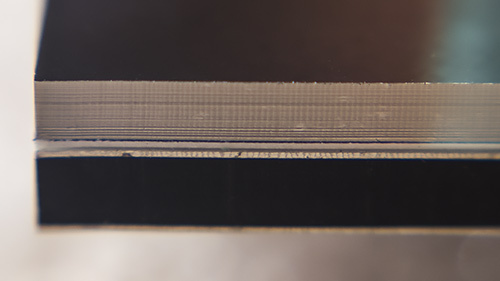 Surprisingly, the ultraHD print is not much more than the Lambda print. The real issue, we think, is whether your image contains sharp detail that would profit from the ultraHD technology. Reprinting a scan of an old family photo might not take advantage of that. 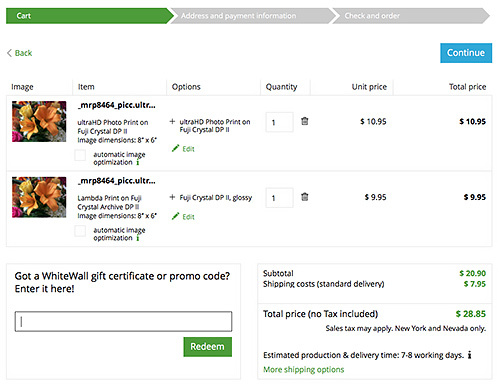 Since ordering our prints, WhiteWall has emailed us several discount offers with savings ranging from 9 to 12 percent, depending on the size of the order. There's also a referral program which credits you and your friend $10 off on their first order from WhiteWall. 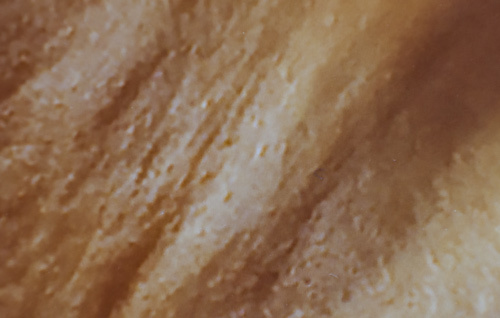 A continuous tone print, whether exposed and processed conventionally or created using dye sublimation does not exhibit any of the dot patterns of an inkjet printer. Those dot patterns, or screens, are typically frequency modulated patterns (although they could be more common halftone screens) that coagulate to build density and appear very sparsely if at all in the highlights. On close examination, you can always see them. But without such a reference to focus on, it's difficult to portray the surface of a continuous tone print. 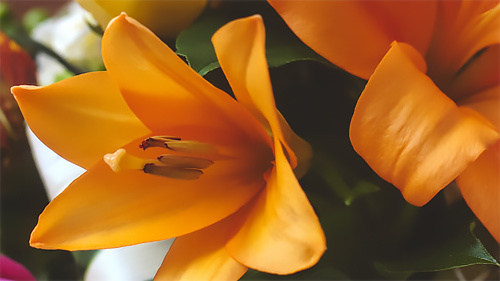 We used a reversing ring on a 35mm prime with the camera mounted on a Durst enlarger post to dial in focus for these macro shots of the central flower's lower petal. We also scanned the individual prints to provide a more visual inspection. Those results we're presenting to you here for your evaluation. Short of looking at the actual prints, we can't think of a better approach to let you be the judge. Our own evaluation follows. Our evaluation of the three prints focuses on four aspects: gloss, detail, color and mount. One thing that was immediately apparent is that the Fujifilm paper used on the two WhiteWall prints is much glossier than the DNP paper. The DNP print is imaged by heating dyes impregnated in a ribbon to over 300 degrees at which point they migrate into the paper as a gas. The print also received a clear coating which can be superheated to crinkle and create a matte finish or left smooth for a glossy finish. Gloss. (l-r) DNP, ultrHD, Lambda prints. Glossy sheets reflect more light and are therefore capable of a greater dynamic range than matte surfaces. And the glossier, the better. So advantage Fujifilm. But we also showed the prints to other eyes, some practiced, some not, in something like a blind tasting since the descriptions didn't matter to any of them. Unpracticed eyes liked them all equally. In fact the DNP print was a good deal better than we had expected it to be, providing worthy competition to the WhiteWall prints. But it was clear to more trained observers that the ultraHD print was sharper than either of the other two prints. And that the Lambda had a slight color shift. Our viewers didn't know one print from the other because we did not label them. But they had no trouble consistently picking the ultraHD print as the sharpest. The macro shots rollover above shows the same thing. The ultraHD print has more detail than the other two. Scans. DNP, ultraHD and Lambda prints. There are surprisingly close, with the DNP print showing slightly more saturation than the other two. This crop doesn't show highlights but the Lambda did show a very slight magenta cast not evident in the ultraHD. It was so slight that we generally had to point it out to the practiced eyes before anyone noticed it. In short, the color cast was not significant and all three prints using the sRGB color space and correct ICC profiles acquitted themselves well. So what about the acrylic glass mount? Well, we liked it. It reminded us of the Fractures we ordered, which were printed directly on glass, in that you could just hang the piece without worrying about a frame. Like a Fracture, this is a sandwich composed of the acrylic layer on top, which is permanently bonded to the Fujifilm print. That, in turn, is bonded to the aluminum Dibond backing with its aluminum panels to which the hangers are attached. Acrylic Glass Mount. Acrylic glass on top is bonded to the print, which you can see bonded to the aluminum panel of the Dibond backing. Dibond has been a leading aluminum composite material for over 15 years. It's composed of two pre-painted sheets of .012-inch aluminum with a solid polyethylene core. It won't distort, providing the flattest panel you can buy, is half the weight of aluminum and is self-extinguishing. WhiteWall offers a free sample pack of their products, which includes 21 4x4-inch samples of its most popular acrylic prints, metal prints and premium papers. The package, a $25 value, does require a $7.95 shipping charge. Even if you print at home, it's worth establishing a relationship with a lab you can trust to print your images professionally. Our criteria for that lab would include a variety of products, bleeding edge imaging technology, reliable reproduction, no surprises and good customer service. On all those counts WhiteWall distinguishes itself. Photo printing as a service provides some interesting options. There's Fracture's glass photos and soon Neomodern's professionally edited inkjet prints. But we think WhiteWall offers something very special, certainly worthy of all four photo corners.